Ranulph Higden (d. 1364), was a monk of the Benedictine abbey of St. Werburg, Chester. His 'Polychronicon' is a universal history, based on earlier writers, but extended down to his own lifetime. This copy was owned in the Middle Ages by the church of St. Peter-upon-Cornhill in London, east of St. Paul's Cathedral, and very close to the present site of the Bank of England. 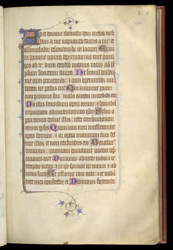 The text opens with a prologue, introduced by a large initial 'P', from which a border extends almost the whole way around the four sides of the written area.